From shotgun expert Terry Wieland, Gun Digest Shooter’s Guide to Shotguns provides everything you need to know about shotguns in tight, lively text and sharp photos. 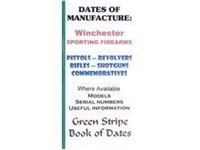 Get the facts on singles, doubles, pumps and semi-autos, ammunition, handloading your own ammunition, shotgun games, hunting and sporting uses. In Shooter's Guide to Rifles noted rifle shooting authority Wayne van Zwoll presents rifle shooting basics and advanced rifle shooting techniques. He looks at rifle ballistics; rifle cartridges; action types; scopes and optics; how to zero your rifle; and pro shooting techniques. Perfect for beginning and advanced rifle shooters alike, Shooter's Guide to Rifles contains historical information, tables, illustrations, and ballistic charts to make it useful for any rifle aficionado. Poor Man's Scout Rifle. Cashner. Until Bob Cashner published the first edition of Poor Man's Scout Rifle in 2003, owning a scout/utility rifle was impractical for most people. Commercial versions were rare and very expensive. Using common tools and easy-to-come-by parts, Cashner showed the average shooter how to fashion his own home-built scouts from a variety of tried-and-true, battle-tested military actions. His versions stayed true to Col. Jeff Cooper's original concept of accuracy and durability as the overriding criteria for such weapons, and to qualify as a poor man's rifle, he made sure his scout rifles were affordable to those on a limited budget. Many things have changed in the firearms world since 2003. The increased popularity of scout rifles – along with the skyrocketing prices for what were once cheap surplus rifles – convinced Cashner to update the original book to meet the needs of today's shooters. This revised how-to guide contains a variety of long-eye-relief scope-mounting hardware that wasn't even on the market when Cashner completed the first book, as well as information on the newest scout rifle scopes; revised prices for rifles, parts and ammo; and some additions and modifications requested by readers. Each of his creations meets the basic specifications of a scout/utility rifle yet costs less than a quarter of what the commercial models would have. The Gun Digest Book of Assault Weapons is all about true assault weapons?fully automatic, selective-fire or equipped with mission-specific features designed only for military and law enforcement applications. &break;&break;This seventh edition gives you all the details you need about the world's latest assault weaponry and ammunition, and the changing missions of those weapons in military and law enforcement applications. &break;&break;No other reference provides such comprehensive insight and details about the always evolving weapons America's soldiers and law enforcement agencies and armed with. 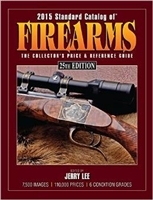 The reader will appreciate Standard Catalog of Firearms as the preferred desk reference guide to the world of antique, vintage and modern firearms from around the world, with over 26,000 listings of collectible and modern firearms. 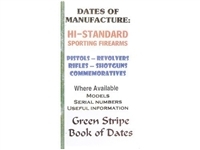 The hobby’s only illustrated firearms pricing and identification guide Includes a blend of features (“Sleeper” alerts, color photo section) found in no other firearms guide 16-pp. color photo section showcasing the hottest trends of the year Standard Catalog of Firearms is a uniquely valuable guide to the world of collectible firearms. In it, the reader will be not only be able to accurately identify collectible firearms but assign values to them as well. With this information, the reader will be able to buy, sell, collect and trade firearms with confidence and without fear that he or she is paying too much or selling for too little. To a collector, this type of information is pure gold. The American Krag Rifle and Carbine, 2nd Edition, Revised. The Krag rifle and carbine were the first smokeless powder, magazine loading arms used by the United States Army. It was adopted from a Norwegian design in 1892 and reached the troops starting in mid-1894. The Krag was the first precision-machined, small caliber, magazine loading rifle adopted by the U.S. Army. This meant that the production facilities and work force had to be completely rebuilt and reorganized. In just four short years, the entire U.S. Army, both mounted and dismounted branches, were completely equipped with the new rifle and carbine. So successful had been the design and initial production phase, that only minor changes were made to the rifle and carbine afterward. It was the ideal time to introduce a new rifle. The U.S. Army in the 1890s was a peacetime organization. The frontier had been settled in the late 1880s and the Army had been reduced in strength to not quite 18,000 strong, and was scattered halfway around the world from Plattsburgh, New York to Anchorage, Alaska to Honolulu, Hawaii. All but two troops of cavalry were still stationed west of the Mississippi River and no military formations in regimental strength had been assembled since the Sioux Wars in 1876-1877. But the combination of Spanish imperialism in Cuba and the sinking of the battleship, USS Maine, led the United States into a short, sharp war in 1898 that gave way to a longer, more bitter fight in the Philippines. In 1900, Chinese revolutionaries styled the "Boxers" threatened to murder all foreigners in China. The U.S. Army and Marines brought their Krag rifles to mainland China in concert with forces from other European nations and quickly relieved the siege of the Foreign Legations at Peking and then helped clear the country of insurgents. Even though the Krag only served the U.S. Army for eleven years, it did so admirably and saw much hard fighting. It only gave way to the Model 1903 Springfield as the latter rifle could be loaded quickly and easily with a five round clip. The American Krag Rifle and Carbine provides the arms collector, historian and target shooter with a part-by-part analysis of what has been called the "rifle with the smoothest bolt action ever designed." Each of the fifteen models of the American Krag rifle and carbine are described in detail. All changes to all parts are described and matched to serial number ranges. 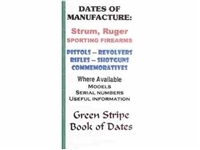 A monthly serial number chart by production year has been devised that will provide the collector with the year and month in which his rifle or carbine was manufactured. The mystery of the so-called Philippine Constabulary rifles is solved and the "School" rifle is introduced. A new and complete exploded view is included as are instructions for assembly and disassembly of the rifle and carbine. by Steve Kehaya and Joe Poyer. A complete analysis of the Communist Bloc's SKS Carbine -the first detailed study of this fine, collectible carbine in twenty-five years. Every part analyzed to tell you how to determine its country of origin and whether or not those parts are compatible between SKS carbines of different Nation's manufacture. This famed Soviet-designed shoulder arm, which together with the AK-47, armed hundreds of thousands of "National Liberation Front" fighters from Vietnam to Angola. It was manufactured in six countries and its total production ran into the tens of millions. Since 1986, over 1,000,000 of those Albanian, Russian, East German, Chinese, North Vietnamese, North Korean, Romanian and Yugoslav SKS Carbines were imported into the United States. That vast number not only provides a fertile field for collectors, but helps keep prices low enough to make the SKS carbine a fine plinking and hunting rifle. The SKS Carbine examines the firearm on a part-by-part basis so that you can determine 1) which parts are original on a particular SKS carbine, 2) in which country they were produced, 3) which of those parts are interchangeable between different manufacturers and which are not, 4) how to read serial numbers to determine date of manufacture and country of origin, and 5) what the inspection markings stamped on metal and wood parts mean. Since the vast majority of SKS Carbines in the U.S. are military surplus, you will learn how to examine and select a fine, shootable SKS Carbine. You are also provided with complete assembly/disassembly instructions, how to manufacture most parts if you cannot find a commercial source, and ammunition characteristics, and ballistic information. An expanded list of factory codes for the Chinese SKS carbines has been made available to the authors by collector Howard Bearse. That information and more has also been included in this 5th revised and expanded edition of The SKS Carbine. The Casemate Short History Series presents readable and entertaining introductions to military history topics. Over seven centuries the artillery piece has evolved from a status symbol to one of the most deadly weapons wielded by man. Using gunpowder weapons was initially something of a black art, but over the centuries gunnery became a science, a dependable method of breaching fortifications, or overcoming an enemy on the battlefield. By the 19th century, most European armies had artillery units manned with trained gunners; Napoleon, originally an artillery officer, then took the use of artillery to a new level. Over the following decades, rapid advances in gun technology paved the way for the devastatingly powerful heavy artillery that literally transformed the landscape during World War I. The use of rolling and box barrages shaped how armies fought on the front lines and powerful naval guns dictated the outcome of battles at sea. By World War II the range of artillery had expanded to include self-propelled guns, and powerful antitank and antiaircraft guns. In this informative introduction, Angus Konstam concisely explains how the development and evolving deployment of artillery led to big guns becoming the key to victory in two world wars and a potent force on the modern battlefield. The Story of Firearm Ignition. James. Describes mechanical design and the firing contrivances for guns from the early matchlocks to modern cartridge arms. Well illustrated with good photos and excellent line drawings. A new approach to a very old subject. Gun Digest Book of Classic American Combat Rifles. Wieland. Great articles, written by great gun writers, about classic rifles! The Gun Digest Book of Classic American Combat Rifles presents a unique compilation of articles on the greatest American combat rifles developed since 1776, and as they originally appeared in Gun Digest. Most shooters recognize names like Springfield, Colt, Armalite, Sharps, and Spencer. Those rifles made it to the top and stayed there, while many other rifle designs were tested and adopted by the U.S. military only to slide into historical oblivion. 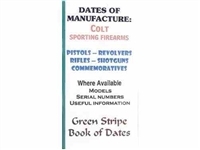 Yet all are part of the history of the American combat rifle, and you'll find these various type of rifles and their stories in this exciting book. Details various types of old hand reloading tools, sights and telescopes. Many of the companies that produced these items, as well as custom makers, are identified. 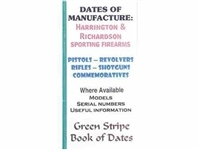 An entire chapter is devoted to the Schuetzen rifle, along with valuable information from the writings of Ned H. Roberts, Harry M. Pope and H. Guy Loverin, is included in the last four chapters. HEADLINE: The Greatest Gun Book of All Time Presents OCo The Greatest Combat Handguns of All Time!The Gun Digest Book of Classic Combat Handguns is an absolutely unique compilation of articles celebrating the greatest combat pistols of all time, as they originally appeared in the worldOCOs greatest firearms annual, Gun Digest, from 1944 to present.Presented by the greatest gunwriters of all time, this volume entertains you with information-packed stories about semi-auto pistols and revolvers recognized around the world as classic combat handguns, from historical combat firearms such as the 1911 and the Luger to modern classics like the Glock. Read about Great Guns . . . - Model 1911- Glock 17- Luger P08- Bren Ten- SIG-Sauer Autos- Snubnosed Revolversand more! . . . in articles by Great Writers: - Frank C. Barnes- John Malloy- Larry Sterett- JB Wood- Raymond Carantaand more!For the collector, for the shooter, for the fan of combat handguns, the Gun Digest Book of Classic Combat Handguns is a must-have resource." he greatest handgun stories from the world's greatest gun book! Here for the first time in one jam-packed edition are 15 of the best handgun articles from the pages of Gun Digest, the world's greatest gun book. These in-depth articles, written by top writers and experts in the field, cover all aspects of the modern handgun scene; self defense, concealed carry, hunting, competition, history--if it's about pistols and revolvers, it's in here. And much more! 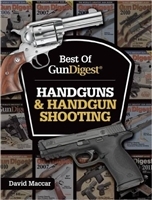 You won't find a more comprehensive or authoritative source for information on modern handguns than Best of Gun Digest: Handguns and Handgun Shooting. Light at the Start of the Tunnel. Mann. Are rifle scopes off the rails? They don't make 'em like that any more ! Big-game hunter Samuel B. Mann journeys to the dark interior of rifle scopes, to bag some big bulls... oppressing our tribe. Among other things he takes aim at image-movement, illumination and ever-larger range multiples, comparing modern scopes with those he has collected from the 'Golden Age', and maps out the way he would like to see hunting models proceed. Book is 205x140mm, 152pp, incl 28 colour pages, line drawings, tables and index. A quick search of Ebay for anything related to sniper rifles—telescopic sights, mounts, manuals, cases, etc.—illustrates the collecting "frenzy" for sniper rifles, both old and new. Weaver telescopic sights used on the World War II-era Model 1903A4 Sniper Rifles sell for $900 to $1,500 dollars, only most of those offered for sale are fakes or are misrepresented commercial sights. The "chat rooms" are full of misinformation because there is very little reference material available. Collecting the American Sniper Rifle, 1900 to 1945 provides accurate information that will allow the collector to determine whether or not a particular rifle or telescopic part—or other accessory—is correct. the sniper rifle with all parts and markings that make it uniquely a U.S. military sniper rifle. the telescopic sight with all parts and markings that make it uniquely a U.S. military sniper scope. the bases and mounts with all parts and markings that make them part of the U.S. military sniper scope assembly. The books also contains a history of the development of each particular sniper rifle and telescopic sight. Its mounting on the rifle and sighting in are described in detail. A history of the development of the rifle leading to its use as a sniper rifle is included in an appendix, as are descriptions of British and Canadian sniper rifles that used American-produced telescopic sights. Model 1903A4 .30 Caliber (Snipers) Rifle with the Weaver M73B1 Telescopic Sight. Sharps Rifle: The Gun That Shaped American Destiny is the story of Sharps firearms from the beginning. Not only are the priceless old illustrated Sharps catalogues reproduced but also a wealth of reliable material about Sharps cartridges and Sharps patents. As you enjoy little known American history, you will better understand the role of the Sharps. Although the Mosin-Nagant rifle was in use for more than sixty years by half the world's military forces, no book in the English language has ever traced its development and identified all its models and variations as manufactured around the world, including in the United States. No provided the part-by-part information needed by the collector and shooter. This is the first book in English, ever written about the Mosin-Nagant. It identifies every single model manufactured in Russia, France, the United States, Poland, Romania, Hungary, Finland, China and North Korea. Every part is described with all changes and markings, making it possible to identify the national origins of not only the rifle as a whole, but of every part. Chapters provide a history of its development and use from 1892 to its last manufacture in Hungary and China in the mid-1950s. Then each part is analyzed showing all changes in chronological order. All variations are described from the original rifle to the M1944 carbine with its unique folding bayonet. All Finnish variations are described and a history of the tiny country's relations with its giant next door neighbor is included to show the derivation of Finland's line of Mosin-Nagants. Sniper rifles from all countries are listed in a separate chapter as is the ammunition produced for the rifle and all accessories issued to the combat soldier. Of great value to the collector is the huge list of markings and codes found on all Mosin-Nagant rifles of whatever national origin, the first ever compiled. The Mosin-Nagant was one of the earliest small-caliber battle rifles developed in the late 19th century. Its rugged design and construction are borne out by the fact that the only changes ever made to its basic design were to shorten and lighten the rifle as ammunition improved and battle conditions changed. The Mosin-Nagant is without doubt, one of the premier battles rifles of the late 19th and early 20th century and a testament to skill of it Russian designer. Whether you want to improve your skills, find your next shotgun or just settle in for a good read, this is the book for you! Cartridge Carbines of the British Army. Petrillo. This book traces Britain's use of breechloading cartridge carbines from the development of the first Snider artillery and cavalry carbines, to the various Martini carbines (Henry, Metford and Enfield), to the Lee-Metford and Lee-Enfield Carbines introduced in the late 1800s. The book concludes with a chapter on the commonly-known Jungle Carbine, the Number 5 Mark 1, as well as a chapter on the specifications for all the carbines covered in the time period. Regardless of age, every child can benefit from learning about gun safety. Whether you want to introduce your child to firearms for hunting or sport – or simply ensure that he or she knows how to be safe around firearms – this is the book for you !